We hear it so often that we’ve come to expect it – prospective students and families who visit Dubuque for the first time are “pleasantly surprised” or report that “it’s not at all what I thought it would be.” That’s because Dubuque really is a Masterpiece on the Mississippi – and it’s a great place to live and go to school. So go ahead, explore Dubuque on our site – but remember, the best way to truly experience it is to be here. Illinois or Wisconsin (head just over the bridges for a great getaway to historic Galena, Ill., or Madison, Wis.). The National Mississippi River Museum & Aquarium, an affiliate of the national Smithsonian Institution, with its new 4-D theater experience. Dubuque Fighting Saints, a USHL hockey team that plays in the 3,200-seat Mystique Ice Center. The Town Clock Plaza, home to free outdoor music and festivals from May through September. The Dubuque Symphony Orchestra and three community theater facilities. The Five Flags Center and the Mississippi Moon Bar which bring national touring acts to Dubuque. The Fenelon Place Elevator (it’s the world’s shortest, steepest scenic railway, where by day or night you’ll get a great view of the historic Dubuque business district, the Mississippi River and three states). Kennedy Mall, Target, Best Buy and a host of national chains – nestled between local dining and retail favorites. Mother Nature’s handiwork that can be viewed along bike trails, above the Lock & Dam at Eagle Point Park, at the Mines of Spain outdoor recreation and nature center or along the Mississippi river walk. And this is just the tip of the iceberg! 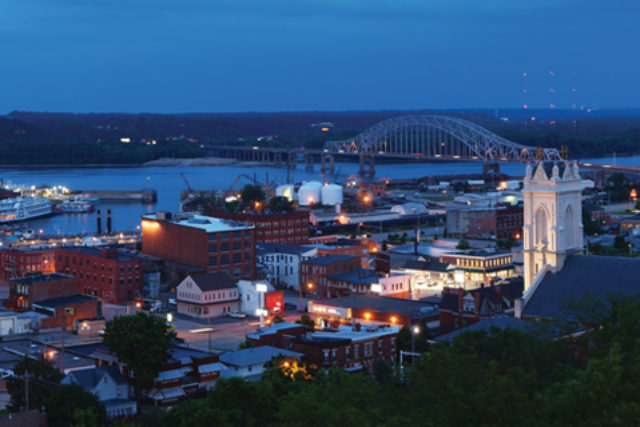 The only way to truly experience Dubuque’s embracing character is to visit in person. Contact the Clarke admissions office today to schedule a visit.